"Dad I'm not cooking, I'm trying to clean"
He sure teach me a thing or two that day, The many uses to Olive were endless and here is one which is sure to leave your furniture looking polish and smelling good. Whenever I use this mixture on my furniture, I love using a microfiber cloth, it makes my job 10 times easier, because it helps with the dirt pick up. With this Homemade Furniture Polish you will feel at ease that you are not exposing your family to chemicals; Its not only environmentally-friendly, but its also great for your pocket. Here is an extra tip, if you are into using Essential Oils like myself. You can use 2 drops of Lemon Essential oil for the 1 cup of Olive Oil and it will also do the trick with this one, I have found that the smell stays longer and its more powerful. We love to hear from our readers Feel free to send us Questions for upcoming Tipsy Tuesdays. Sounds really interesting method of cleaning. 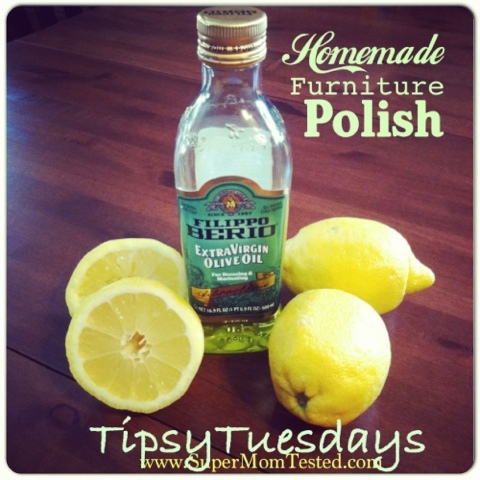 All the ideas that you share is totally useful and likely effective when we talk about furniture cleaning using this mix liquids you share on your blog.